This has been a long time coming...I took these pictures forever ago. 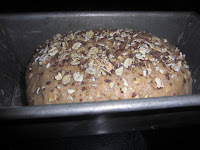 Here is my bread recipe. 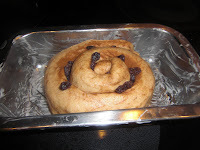 Option 2: Cinnamon Raisin "Snail Bread"
Roll as you would a cinnamon roll. Dust roll with cinnamon and raisins again. Grind your grains. 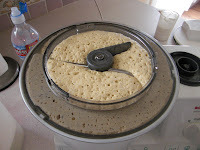 Do this as close as possible to when you make your bread. The fresher the better, the nutritional quality of the flour decreases quickly...imagine how little is left from the grocery store bread! Keep any left over flour in your freezer. 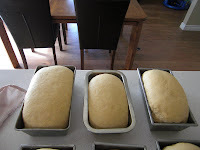 I fill the entire machine, and the recipe uses the majority of the flour to make 6 loaves. 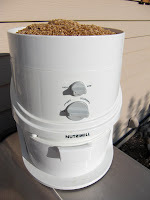 I use a Nutrimill. I love it. In the summer I grind my grain on my deck in the backyard. In the winter in my garage. While they advertise it as quiet, it is still pretty noisy and can get dusty. But it is the best electric mill on the market. Add 9 C of flour and yeast into Bosch mixer. Mix until combined. Add water. Mix until smooth. Cover and let sit and sponge for 15 minutes. This is when I grease my pans, or enlist my children to! 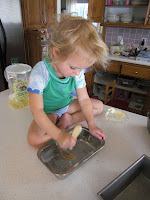 Callista loves to paint the butter on. 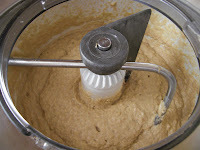 Turn mixer on low and add remaining ingredients. Add the flour last 1 c at a time. 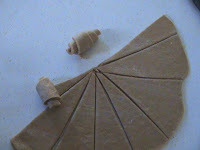 Add only until the dough begins to pull away from the sides of the bowl. Mix on medium speed for 5 minutes. 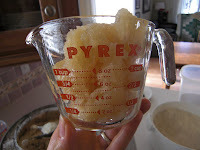 Grease your hands and divide dough into 6 equal parts. Knead several times with your hands on a clean greased surface. 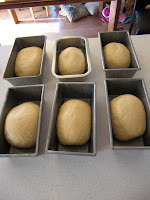 Put loaves in bread pans. Cover and let rise until double in size. This will take anywhere from 30 minutes to 2 hours. It is faster the warmer your house is. Put pans in a cold oven. Be careful not to let the pans touch. It is tight fit. Unless you are one of those pampered people with double ovens. Turn oven to 350 degrees. Bake for 30-40 minutes. Begin checking at 30 minutes. The trickiest part is knowing when these are done. 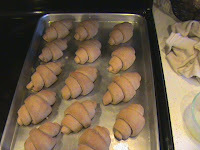 They should be golden brown and sound hollow when you tap on them. Brush the tops of loaves with butter. Let loaves cool on a wire cooling rack for 10 minutes. 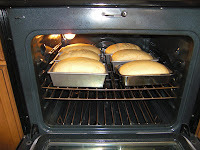 Shake loaves loose and finish cooling out of pan on rack. Store in bread bags in the freezer. The bread will stay fresh in the freezer for weeks. 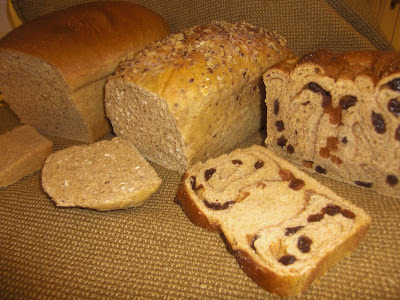 Once your bread is at room temperature it is best if eaten within 3 days. Do not store in the fridge. Thank you so much Rebecca. You you know, you really are totally amazing. WHat you have done with your blog, it is a small encyclopedia. Thank you for being such an inspiration. Love you! I soo agree with Charlotte. I feel like you are a one-stop shopping for everything wonderful and healthy. Thank you a hundred times over! Becca, you're amazing! I hope I can grow up to be like you some day. =) That bread looks so yummy! And happy b-day! I'll call you tomorrow and tell you why I can never remember if it's the 5th or the 6th of Jan, but I was thinking of you! I'm glad you had a good day!